← 10/22 Stock Is Here! Amidst the chaos that is work, I have finally managed to get something done. 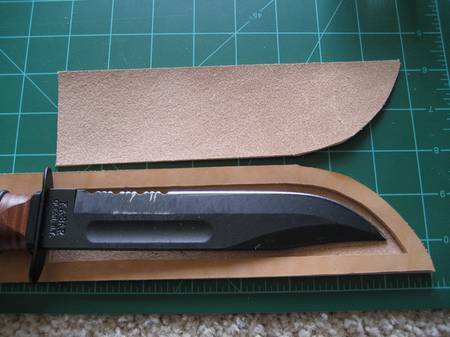 Last summer, or the one before, or even the one before that one, I decided I needed a different sheath for my Ka-Bar because I didn’t want to trash original one while stomping through the woods and camping. The original is nice and all, but it doesn’t have an easy way to attach to something like a belt or backpack strap either. My version will have snaps on the belt loop. I like snaps on belt loops. A lot. I did a bit of planning and came up with the ingenious idea of copying the original and changing it just a bit. I drew a quick and dirty template by tracing the blade and adding half an inch or so for stitching and the spacer to keep the blade off the thread. It just happened to end up the same size as the original sheath. The basic process is to make the pattern, trace the pattern, cut the leather, and sew the pieces together. Of course it didn’t work out that simple. The sheath needed some subtance to it so I made one of the pieces the full length to add some substance and serve as the back of the sheath. The front of the sheath is just the length of the blade. The middle layer is made up of a full length piece with a cutout for the blade. This layer also has enough extra to serve as the belt loop and fold over the back. One additional layer is in the blade portion of the sheath to open up enough space for the blade to slide in. All of the pieces were glued together with Gorilla Glue because I like using it and it works good on leather. 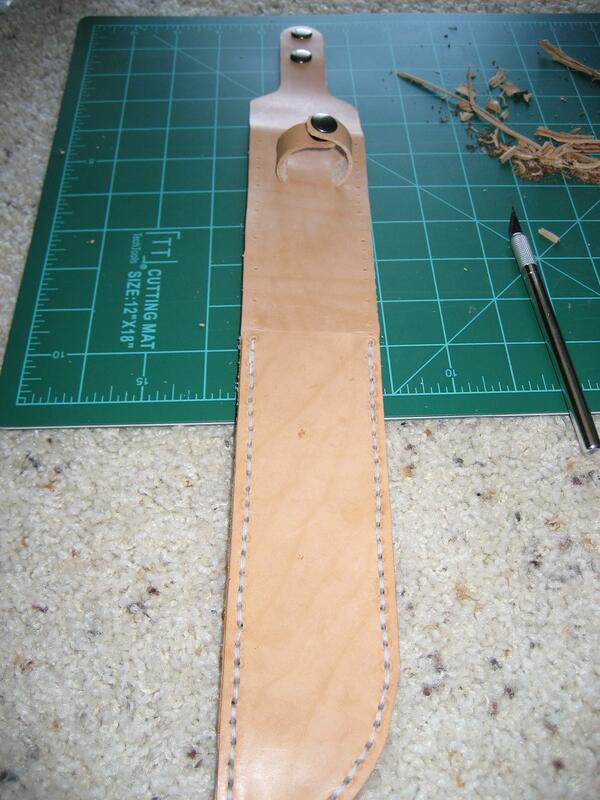 Once the glue is dry, the sheath was marked for stitching, drilled, and sewn. I’ve found punching for stitching doesn’t work on leather this thick, especially once glued. Drilling with a small bit in the Dremel is what I have found to work the best. Stitching required much more thread than I anticipated due to the thickness of the sheath. My process on this one was to stitch down and back up each side of the blade independently. This formed the basic sheath. Next was to stitch the top half together. First though, the handle loop needed to be attached. This was done by making a strap long enough to wrap around the handle then putting it through a pair of slots cut into the front layer. The back layer also go the snaps for the belt loop. Doing it this way keeps everything hidden inside and looking clean. Stitching the top was done along the bottom, just above where the blade slides in – which was triple stitched for durability – then up the side, across the top where it will be folded for the belt loop, then down the other side. The final step was to oil the entire thing with Obenauf’s Leather Preservative. It still needs a few more applications but in the end it will match the axe mask and hanger I made a few months back. I wasn’t really paying attention to the orientation of it, but ended up making a left handed version or maybe it’s backwards right handed. Someday I may make another one to fix this issue, but it will work as is for the intended purpose. Total time from gathering materials to finished product was maybe two to three hours. The most time consuming part was the stitching just because of the amount of it. Hopefully I’ll have the chance to try it out soon and see how it performs.